Memaw passed away last night in peace. She's truly one of the best women I have ever known. Sorry for your loss. Grandmas are special blessings. Sorry to hear that. Glad you had a chance to spend time with her. Yes, I'm thankful for all the time I got! Thank you, Angela. Sorry Cathy, Praying For Your Family. I'm so sorry Catherine! I truly enjoyed reading what you had to say about her and her visits with you. She seemed like such a sweet lady. I hope you and your family are doing okay. Thank you, Beckie. I loved her visits; they were easy to write about. :) We are all doing okay. We had plenty of time to say our goodbyes and that made it easier. Oh no, so sorry Catherine. Wishing you and your family peace in this time of loss. Thinking of you. Thank you, Kristi, we've all had a precious time recalling memories. Been thinking about you Catherine. Big hugs. 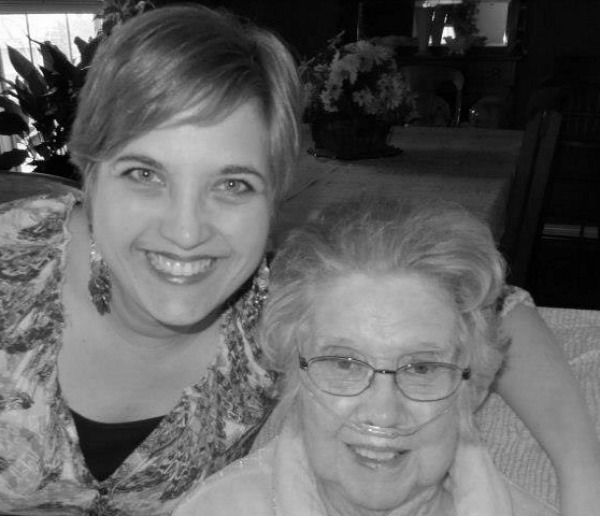 I love this sweet photo and I know you will miss her dearly.